Macao Government Tourism Office (MGTO) and the Ministry of Finance, Commerce and Blue Economy of the Democratic Republic of São Tomé and Príncipe signed a Memorandum of Understanding on Tourism Cooperation today (27 April), with the hope to create mutual success and share harvest in tourism. 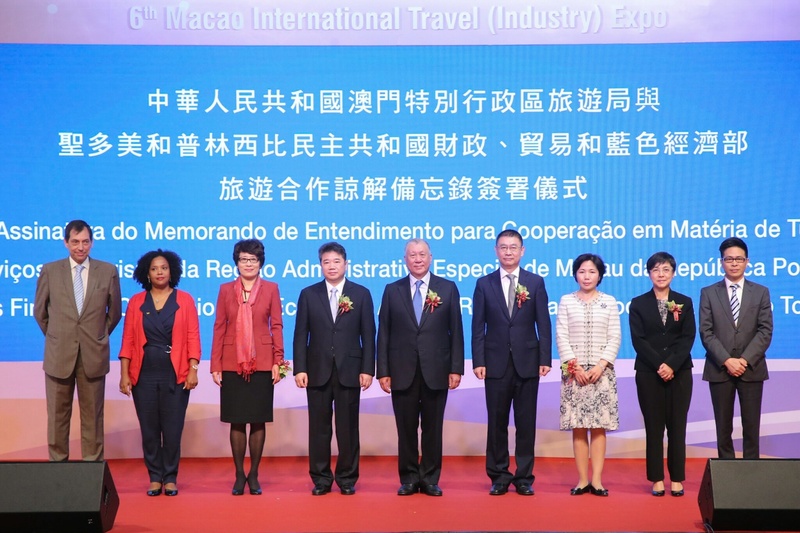 Macao signed a Memorandum of Understanding on Tourism Cooperation with São Tomé and Príncipe at the opening ceremony of the 6th Macao International Travel (Industry) Expo (referred to as “MITE”). Director of Macao Government Tourism Office (MGTO) Maria Helena de Senna Fernandes and Director General of Tourism and Hospitality, Ministry of Finance, Commerce and Blue Economy of the Democratic Republic of São Tomé and Príncipe, Mírian Solange Barroso Daio, signed the Memorandum on behalf of the two parties. Vice Chairman of the National Committee of the Chinese People's Political Consultative Conference, Ho Hau Wah, Party Group Member of the Ministry of Culture and Tourism of the People’s Republic of China, Li Shihong, Deputy Director of the Liaison Office of the Central People's Government in the Macao Special Administrative Region, Yao Jian, Acting Commissioner of the Office of the Commissioner of the Ministry of Foreign Affairs of the People’s Republic of China in the Macao Special Administrative Region, Wang Dong, Secretary-General of the Permanent Secretariat of the Forum for Economic and Trade Co-operation between China and Portuguese-Speaking Countries (Macao), Xu Yingzhen, Deputy Secretary-General of the Permanent Secretariat of the Forum for Economic and Trade Co-operation between China and Portuguese-Speaking Countries (Macao), Rodrigo Brum, MGTO Deputy Director Cheng Wai Tong, together witnessed the signing ceremony. For the main purpose of cultivating talent for the tourism industry and considering its significance to the economy of Macao and São Tomé and Príncipe, the Memorandum aims at eight objectives as follows: exchange information on formulation, definition and implementation of policies on the tourism sector; share experience regarding planning, management and certification system of tourism activities; develop collaborative relations and partnerships between small and medium-sized tourism enterprises from both sides; assist the tourism sector, travel agencies and hotels in organizing promotional activities; exchange information on tourism market trends as well as other technical and statistical data; assist in establishing an incentive system for promotion of the tourism industry; tourism promotion primarily through research on the tourism image of both destinations, promotional activities, participation in travel fairs and business forums as well as other related activities; training and skill development of technical professionals in the above fields. Among the eight Portuguese-speaking countries, MGTO has signed memoranda of understanding or cooperative agreements with tourism bodies from six of the countries. In specific, MGTO signed memoranda of understanding on cooperation in tourism with Cape Verde, Guinea-Bissau and Mozambique in 2010, with East Timor in 2013 and Angola in 2015. 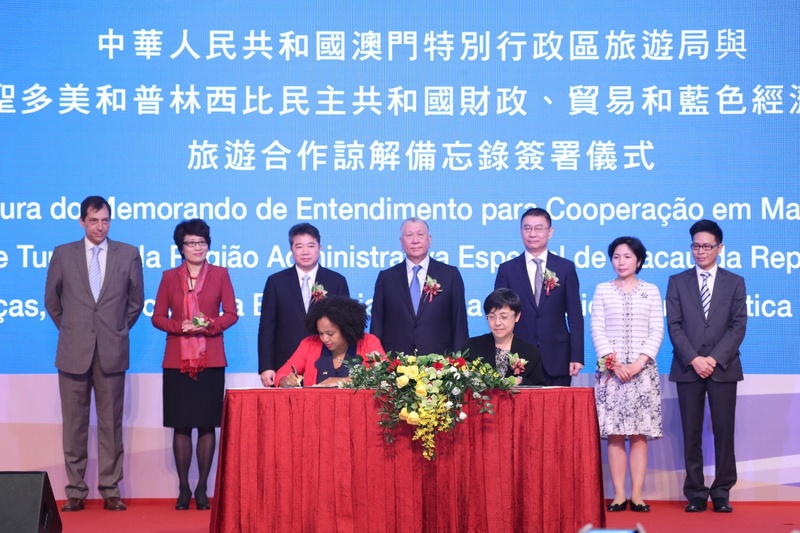 In addition, in 2016, the Secretariat for Social Affairs and Culture of the Macao Special Administrative Region Government signed a protocol on cooperation in tourism with the Ministry of Economy of Portugal. MGTO continues to partner with the Permanent Secretariat of the Forum for Economic and Trade Co-operation between China and Portuguese-Speaking Countries (Macao) in organizing training programs tailored for tourism personnel. In late 2017 and early 2018, government personnel of tourism bodies from São Tomé and Príncipe and other Portuguese-speaking countries were provided with training for a period of two weeks each. Starting this year, MGTO is going to organize three training sessions for tourism personnel from São Tomé and Príncipe annually, each lasting for two weeks.